The total number of Sprints produced by the factory has always been a debatable issue. In truth, we will never have a definitive figure since the only records at the factory that could verify numbers were destroyed in a flood in the late 1970s. The Sprint certainly sold well enough to allow Lotus to stretch out the Elans production life and therefore achieved the aims Chapman and Rudd set out in 1970 to pep up the Elan range. Domestic Elans were still sold in component form up until production ceased, the introduction of VAT in April 1973 killing off any cost advantage. However, as they became more expensive and buyers less willing to assemble the kits, the number sold tailed off to the extent that in October 1972 Autocar declared “few Elans are now bought in kit form in Britain.” It is also known that by the end of 1972 demand for the Sprint was dropping off, with Sprints parked up at Hethel, even on the test track, waiting to be sold to dealers. Lotus in fact told dealers that for every Europa (for which there was high demand) they bought, they would be obliged to buy two Sprints, to clear the back log. John Bolster in his book gives a total production figure of 1353 and it must be remembered that he was very close to the factory at the time. He seemed to have very good access to the factory, the cars and the people, judging by the number of articles he wrote in contemporary issues of Autosport. This is also the figure given by Lotus in Lotus World of Aug/Sep 73 when they announced the end of the Elan line. Another figure appears in Peter Nunn’s article in Classic & Sportscar April 1982. He gives total Sprint production as 1314, 1056 for the UK market and 258 for export. He says that he got the figures from the factory or an Elan expert, but he can not remember exactly after some 20 years! 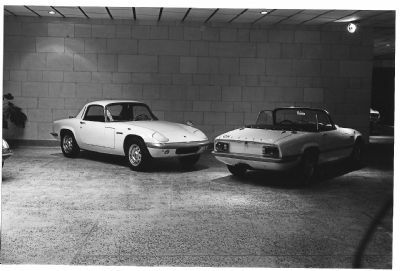 According to the factory, when I asked them for numbers, there were 748 Elan's built in 1971 and 537 in 1972, giving a total of 1285. However, these figures may be from the Golden Gate Lotus Club and even the factory can not verify them. Any further breakdown by the factory is not now possible. There are batches in the books which have no information next to the VIN numbers and in fact all records of unit numbers from 0172 (June 1970) to 0501 (August 1971) for the domestic market Elans and some H type cars were destroyed in the flood at the factory in the late 1970s. Further, we do not know when the Federal cars were first imported into North America – or indeed when the last ones were sold – which makes it difficult to identify which J and K VINs are the definative first Sprints. It does however seem clear that the factory made about 14 odd Federal Sprints from unsold Federal S4s between Feb and Aug 1971. These must have been the first ones for development and testing, though I know of one made for a UK based US soldier in April 1971. Then it appears that remaining Federal Sprints were only made in the one year period between Aug 71 and Aug 72. It is entirely possible that a few unit numbers were not allocated, but we just don’t know. At the time of manufacture any regard to historical information which may be required in years to come was just not considered. This makes our lives difficult now but it’s certainly a subject that the Lotus community can discuss for a long time to come! What is clear from the unit identification numbers I have collected is that sequential numbering was used from January 1970 for all E, F, G, H, J and K model types i.e. Including S4 SEs and Sprints, through to final Sprint production. This is helpful and we know that Sprints were actually made on the production line from January 1971 through to March 1973. Therefore in theory, if we know the final unit numbers for each type and subtract the S4 numbers, we should have final production figures, assuming the sequential numbering worked, to which we must add the S4/Sprints converted by the factory. This 1353 rather neatly coincides with the Bolster and August 1972 Lotus figure for Sprint production. It is clear that there will never be a definitive answer to exactly how many Sprints left the factory. However, I hope that I have got as close to an answer as is possible. These are not sequential as Big Valve twin cams were also being fitted to the Plus 2S 130 and Europa at this time. Numbers appear to stabilise after early 1972.